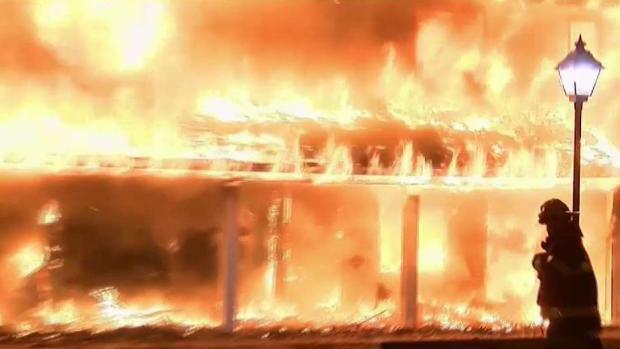 A 71-year-old woman was found dead after a raging blaze gutted a private, gated apartment complex on Long Island Tuesday, authorities say. Greg Cergol reports. A 71-year-old woman was found dead after a raging blaze gutted a private, gated apartment complex on Long Island Tuesday, authorities say. Homicide detectives responded to the fiery scene at the Fairfield Courtyard at Coram on Country Club Drive, but a preliminary investigation indicates no criminality was involved. Multiple fire departments were needed to extinguish the inferno, which broke out around 2:30 a.m. It was under control 90 minutes later. It appeared the fire was contained to one building, but the siding of a neighboring building was beginning to melt away, video from the scene showed. The woman who died, Susan Harelick, lived in one of the apartments in the burned building, authorities said. A cause of the fire wasn't clear. One person was also taken to a hospital in unknown condition. Police evacuated nearby buildings out of an abundance of caution as firefighters saved pets from the burning complex and worked to reunite them with owners. One woman, Dotty Carpin, told News 4 she and other neighbors believed the fire started in an apartment below hers, where a resident who uses an oxygen tank lived. It wasn't immediately clear if that resident was Harelick. Carpin says the flames consumed the building so fast she barely had time to get out -- and now she says she has lost everything. "The whole front of the building was engulfed in flames," she said. "I had to duck and run out ... so shocking ... horrible ... horrible." At least 10 people, including Carpin, were displaced by the blaze. The Red Cross says it was assisting them with temporary lodging.